Phillips 66 employee volunteers planting trees along a ditch beside Paul Revere Middle School. Involve your group, large or small, in an exciting service project. Become an Adopt-A-Ditch partner today. 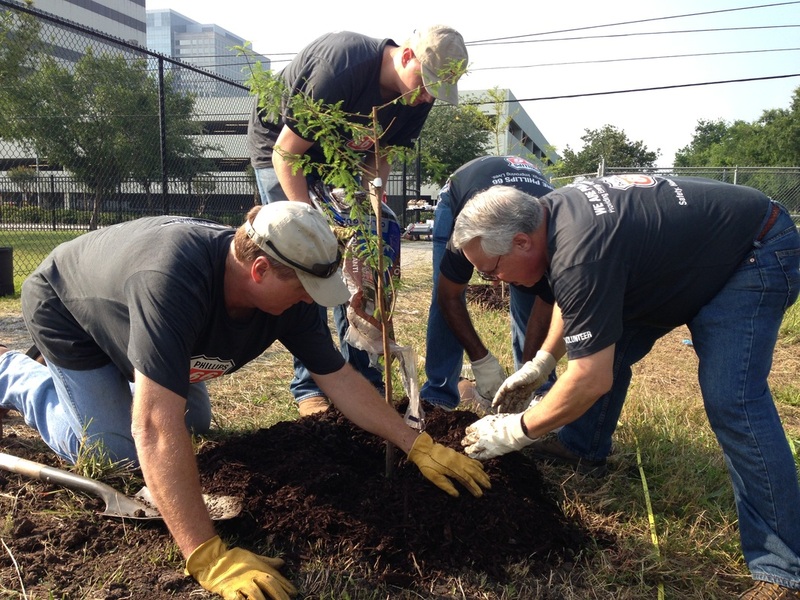 Targeting tree planting along center-line ditches, Keep Houston Beautiful's Adopt-A-Ditch tree program transforms public drainage esplanades into cleaner, more environmentally pleasant areas. A healthy tree canopy provides shade, reducing energy consumption while sequestering carbon dioxide and cleansing the air. The overall scope of this program is to add landscape character to keep the ditch area free of litter and debris while improving the quality of the stormwater. It also has the added benefit of stopping illegal dumping by the installation of features such as trees that serve as physical barriers while at the same time providing habitat for birds and contributing to carbon sequestration. Use of native trees fitting to the surrounding landscape are a real asset to neighborhoods. Also, the deep root systems of the trees add to the ditch bank stabilization. KHB works with the City of Houston Public Works and Engineering Department, Street and Drainage Division to identify center-line ditch sites. Adopt-A-Ditch is an expansion is a partnership between the City of Houston, Keep Houston Beautiful, local merchants, volunteers and residents.